Master Mechanic Markham & Markville are showing their support for their customers and their community in a new way this year by sponsoring the Gagnon family’s Aurora Diggers softball team. Chloe Gagnon plays for the Aurora Diggers U16 Bantam Girls Fastpitch team. The team has had a wonderfully successful season! 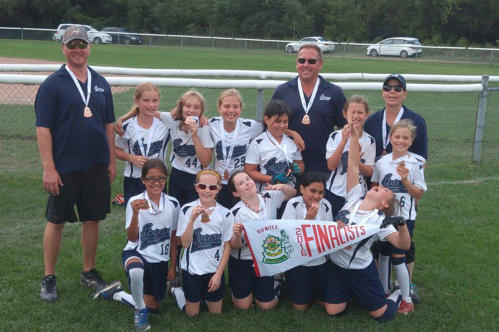 Medaling in the Provincial Grand Championship qualifying them to play in the National Championship in New Brunswick. There are 12 girls on this team, and most of the girls are 14 and 15 years old. Additionally, the team has now been together for several years, and train 10 months a year. These girls are very dedicated, and they have recently starting to see the results from this hard work placing third in the provincial qualifiers and beating 5 of the top 10 teams in Ontario to qualify for Nationals. In Aurora and smaller towns, funding is always an issue. Moreover, with the large hockey base in York Region, most fundraising dollars goes towards other teams. The estimated cost per family for this tournament is approximately $2,000 with the cost of travel, lodging, food, and fees. There are a few families on this team that will have a very difficult time getting enough money to pay for this tournament so the team took to reach out to the community for support. Master Mechanic Markham/Markville answered the call and have contributed towards the cost of the tournament. On behalf of all Master Mechanic locations, we extend huge congratulations. Cheers to all of the girls on their accomplishments this season! Congratulations girls! Keep the spirit strong and have fun in New Brunswick.